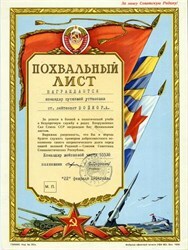 Beautiful certificate from the Russian Army issued no later than 1989. This historic document has an ornate border around it with a vignette of tanks, missiles, jets and a submarine. This item is handsigned and is over 20 years old.